FlexMail is a variable data design and printing solution, unmatched in its versatility and performance. FlexMail lets you connect to your data, prepare the data for your project, design your output, and print at high quality and speed on any printer. There is no need for specialized personnel to design and/or operate the software. FlexMail is easy to use because of its intuitive user interface incorporating ribbons, tooltips, context sensitive help, and wizards that take users through more complex tasks. Because of its close similarity to the latest Microsoft Office, it is very easy to understand FlexMail’s user interface and operation. 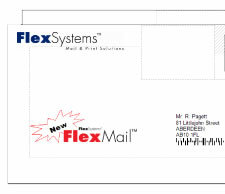 The FlexMail software is international and multilingual. It supports the (postal) standards of a growing list of countries. You can select the language version you want to use and switch between languages if necessary.